What a nice surprise in the Washington Post! Lisa Miller’s Jan. 20 review [“ There are fads and cults. Then there’s Scientology ,” Outlook] of Lawrence Wright’s book “ Going Clear: Scientology, Hollywood, and the Prison of Belief ” decried bias against religious minorities, yet Wright’s book represents exactly that. Forty pages of endnotes may have impressed Miller, but what they refer to are a collection of stale, unfounded tabloid stories, decades-old false allegations and rank speculation mostly sourced to a handful of bitter individuals kicked out of the church a decade or more ago. Miller’s review also failed to note that Wright’s United Kingdom and Canadian publishers chose not to publish the book, which speaks to the quality of his facts, allegations and sources. If a book tells the truth, would any publisher worry? Millions of Scientologists around the world embrace the religion. Their experiences of happier and more fulfilling lives fuel the church’s international expansion, and our humanitarian programs help thousands daily. Since Wright began his research, we have opened 30 churches worldwide, a dozen in 2012 alone, and a National Affairs Office a half-mile from The Post. Those facts were not in Mr. Wright’s book or his endnotes. I just wish that these do called authors would write the truth about Scientology instead of following their suppressive agenda of trying to destroy Scientology. What is so wrong with the truth? This book is a aster of time. Scientology rocks and no fake news book is ever going to change that. I am not a Scientologist but it sure does get a lot of underserved flack. So many people just seem to day the same old things without proof. Anyone can see that is heard the way to take any position. Can’t this author get anything right? Don’t seem to be possible. Understanding this book was like getting sick on a diet of lies. Yup. Listening to critics like this man can only disturb the soul and heart. To read this book is to read the words of an angry man. I pity him. I am not a Scientologist either and I agree with you wholeheartedly. It is so obvious that this is the work of some person with suppressive tendencies who has it in for religion. Probably some left winger atheist who would like to see government taking more of our God given freedoms away. Pat, Pat, Pat. I’m not attacking anything. I’m asking difficult questions that you don’t like. I’m sorry you don’t like them, but there’s nothing wrong with critically asking questions about where any organization spends its money. But you don’t know where it does, so you’re unable to answer. Have you ever asked management to see the finances? Others have- they won’t show you. Maybe you’re okay with that. Maybe that’s good enough for you. If so, how nice for you. Some people, however, want to know more. You see exactly what you’re allowed to see. And that’s okay with you. I’m not doubting that you’re satisfied with what your management allows you to know about what they do with your money- you clearly are. But that doesn’t make it wrong to ask the question. Can’t say I have ever heard of the book but it sounds pretty bad. Unless you like reading old retreaded falsehoods, don’t bother. LOL!!! Too many unqualified people seem to think they can write a book! hey you know what? 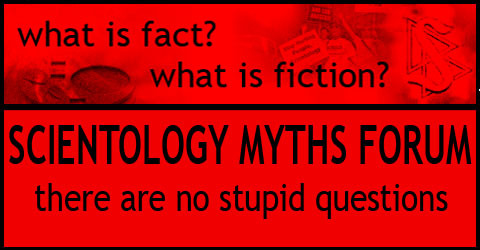 I just researched all the questiones that were asked in this dreadfully long thread and found just about every answer at scientologymyths.info dang that would have saved me allot of grief lol. damn, wrong spot. My bad. I feel sorry for these people who try to ridicule people’s religion. The truly sad part is how committed they are to doing it. It’s a sickness. I see allot these crackpots going on about how they are trying to help the public and so forth —your not helping anyone, and my guess is if you have this much time to devote to harassing people, then you probably don’t have a job or don’t have a fulfilling one. If you want to be of service to people then join the SERVICE. Or if you are physically or MENTALLY incapable or some how handicapped, there are so many other areas of service you can apply to. (Deep breath) ok I feel better. Ill read the book and buy it used so the author gets nothing from me. Scientology is a gift and one if not the greatest religion ever iv studied it for years and I can’t wait for the day I into a church and ask how can I help. What an awesome point of view, Michael. LRH says a being is only as valuable as he can serve others. you can also click on my name, Michael, for a recent interview where the author acknowledges and discusses some of the errors in his book. You seem like the type to be willing to learn everything about a subject! This book has really started a great deal of research! Just like, I’m sure, the recent lawsuits have generated interest in finding out the truth! Newsweek columnist Tony Dokoupil has come across a previously unconsidered source in finding information about Hubbard’s life- the files and records of the Explorer’s Club! It’s a great idea, because LRH was very proud of his membership there, and told them so very much! When writing going clear, Wright used later-day sources when talking about LRH’s war history, but entirely failed to consider the private letters written by the then-young man! These records are found in his letters to the explorer’s club and response to the club’s survey. While LRH later claimed that he was flown home injured, he told the club that his orders were canceled, and had two book reviews in the club’s next newsletter during the time he was supposedly at war. While LRH talks about his grave injuries that he self-treated using dianetics, he again told the club something very different. He complained to the club about “losing his command” and that his injuries amounted to “nothing very romantic—combat fatigue, ulcers, a bad limp.” He also signed into the Explorer’s club (they have a log book) during a time that he later claimed he was at war. That’s the tip of the spear, but all very interesting. Sorry, if that’s your “source” for that allegation then you’d better look up the definition of documentation. What document (lecture, bulletin, book etc.) is it from where LRH made this claim in 1945? so the official spokesperson for scientology isn’t an accurate source? was he wrong in what he said? so how do YOU think Hubbard healed from his claimed ‘war injuries’? I’ve heard him tell about researching Dianetics on others while at the hospital, but never once did he claim to heal himself with Dianetics. If you had read the book you’d know that would have been impossible, due to the nature of the unconscious mind. If I had to guess, SINCE HE WAS IN A HOSPITAL, that the hospital or doctors, using medical knowledge, had something to do with his getting better. But then that would be too presumptuous on my part to assume that (sarcasm, btw, in case you were going to take it literally). Yup, sure did- because it was said literally. You probably never read the interview, so I can’t blame you for not knowing, but the official scientology spokesman said that during the interview as an explanation for what scientology “is”. He wasn’t being sarcastic and never claimed that he was. You’re just throwing that word out there and wishing it’s true. Of course, Tommy Davis disappeared immediately after that interview, so maybe he said the wrong thing. Hmmm, okay, so the official spokesperson for scientology was wrong. I guess that makes sense, since the last two spokesmen for scientology are now very critical of the church, huh? Maybe a third, since you’re telling me that hubbard DIDN’T cure himself in the hospital, which Tommy Davis said means that scientology is based on a lie. But, as we can see in his war record, hubbard tended to lie a lot (nature of injuries, awards, etc). So… you were saying something about the doctors and their medical knowledge? And so there came a further blow – I was abandoned by family and friends as a supposedly hopeless cripple and a probable burden upon them for the rest of my days. Yet I worked my way back to fitness and strength in less than two years, using only what I knew about Man and his relationship to the universe. I had no one to help me; what I had to know I had to find out. And it’s quite a trick studying when you cannot see. Looking at his “My philosophy” article, he does NOT say he healed himself with Dianetics. He says ” Yet I worked my way back to fitness and strength in less than two years, using only what I knew about Man and his relationship to the universe.” People have apparently assumed that he was talking about the procedure of Dianetics, and using it on himself. That’s something someone twisted out of what he actually did say. I saw the interview. Tommy does NOT say that he healed himself using Dianetics procedure. Dianetics is much more than a procedure. It’s an empircal study of the mind that works. according to Tommy Davis, at the time the official spokesperson for Scientology, Scientology being based on anything but a lie is dependent on Hubbard being injured and healing himself using Dianetics.If that didn’t happen, Scientology is based on a lie. I guess it’s difficult to see that when Tommy says “if…” it is not the same as LRH saying it. You have B equaling A here. L Ron Hubbard, in his own words, only says that he got well while researching. Please find me the exact reference where he says he healed himself using Dianetics. Silly Pat. Of course Hubbard didn’t heal himself using Dianetics- there was no such thing yet, so it would be impossible for him to reference it as such. More so, it would be impossible for Hubbard to heal himself of the afflictions that he claimed, since his medical file clearly shows that he wasn’t telling the truth about his injuries. What you DO have is the official spokesperson for Scientology making that claim. Specifically making that claim. Saying it very clearly. That’s coming from the spokesperson for the management of Scientology. Was management wrong or misleading? It’s interesting to me that you’re acknowledging that scientology management, as represented by their chosen spokesperson, could say things that aren’t necessarily the same as what Hubbard said. I wonder how many other times that’s happened? Of course, maybe that’s why Tommy disappeared from the public eye AND the scientology website right after that interview? Oh, Pat- you’ve ignored this same conversation so many times before. I’ve seen Hubbard’s actual medical records. They’re available via an FOIA request. You can actually see his honest to goodness medical file- have you ever seen it like I have? What Hubbard claimed happened to him is not in there. He claimed that he was in a military hospital with certain injuries. The military itself claims otherwise. He lied. And what do you call what Tommy said? He said that either Hubbard healed himself, or scientology is a lie. His claim is that Hubbard healed himself, but the medical records prove that he did not even sustain the injuries that he claimed. So in Tommy’s own words, scientology is based on a lie. Oh, Pat- you’re just being snarky now. It doesn’t become you. I’m being very clear, and saying exactly what I mean. Hubbard lied. And the statement of the scientology spokesperson is that scientology, then, is based on a lie. Don’t take my word for it- request Hubbard’s actual medical records for yourself. You can do it, just submit a FOIA request. You can have the actual document in your hands and see for yourself. But, in them, you would see that what Hubbard claimed is not true. It’s right there in black and white. I’m going to go out on a limb here, Pat, and assume that you believe that what Hubbard said about his injuries is true. Why do you believe that? Have you looked at the evidence for yourself, and actually taken the time to consider if the many claims to the contrary are valid? I mean, a lot of people are calling them lies and claim to have seen evidence to the contrary- I’m not the only one. Why do you believe his claims are true? Is it because you’ve been told that they’re true? Why haven’t you taken the time to look at the evidence and base your belief on that? Why can you just accept what management is telling you, when you have the means to see it for yourself? Since what he researched (Dianetics and Scientology) works by my own personal observation and experience I have absolutely no reason to question him. That’s like saying that you have to investigate the doctor when he tells you to get more exercise and eat better, and you feel better when you do. I tried it for myself and it worked. You’re not being asked to believe something without that personal observation, so I can only take your insistence on ad hominem on the man as having ulterior motives. What was important here? Did what he gave us work or not? You can continue to try to devalue his contributions. You won’t find any sympathy here for your inability to DO. L. Ron Hubbard begged for psychiatric help after the war. Even if that wasn’t photoshopped and a forgery, it’s irrelevant. You guys just don’t get it. Ad hominem attacks seems to be the only thing you can do. So obvious. It’s awesome that the director of public affairs wrote a letter to the editor? Am I missing something significant here, or are we just celebrating the fact that her letter got published? I think it’s worth celebrating, because it shows that the paper is willing to discuss both sides. While the paper itself published a positive review of the book, it’s nice that they allowed the letter to the editor to be published. I’m with you, yay fair journalism! On a related note, I’ve seen Karen speaking (in writing only, not publicly) for the church much more often lately. Why is Tommy Davis no longer representing scientology on camera? He has not been seen in public since the taped interview when he said that if Hubbard didn’t heal himself from his injuries using Dianetics, then Dianetics is a lie. And if Dianetics is a lie, then Scientology is based on a lie (I paraphrase). He hasn’t spoken publicly for scientology since that time, which is interesting given the fact that LRH’s own letters and military records suggest that he actually didn’t heal himself using dianetics. You might be on to something- it appears that he was removed from the Scientology public affairs website (I hear in 2011, when I looked into it). I hope he’s okay- I hear that he and his wife are living in Texas now. Karen has been PR director long before Tommy became spokesman. (Two different posts, btw). Ah, maybe that explains where shelly miscavige is, then. May I ask how you know that? It’s about the only thing that Wright got right in his book. It’s old news. I actually haven’t read the book yet. Have you? The timing seems very… convenient. He says something that allows for the possibility that Hubbard was lying and pokes a hole in the validity of scientology as a whole, then suddenly takes a leave of absence?